Maybe I'm just contrary, but I've never quite agreed with the notion of the "odd-even" curse for Star Trek films. That concept states that even numbered Trek films rule while odd-numbered entries drool. Yes, it's true that volumes 2 and 6 are the best of the bunch and 8 is very good as well, while the first picture is easily the worst, and nine and five aren't that great either. However, I really like the seventh (Generations), and even nine and five are entertaining, while I dislike the fourth film; at this point, I'd rate it above only the abysmal first movie. Star Trek III: The Search For Spock is also a pretty good film, but I think it's always suffered because it follows the second picture, the one that so many people love. It's hard to follow such a hugely successful project, and although Search doesn't quite match up with its predecessor, it's still quite exciting and entertaining. Its main fault stems from a plot that largely lacks nuance. It offers a very blunt and direct storyline. The crew of the Enterprise go to find Spock, and that's about it. It includes no real subplots and just concentrates on matters that directly relate to Spock's final outcome. Not much else spices up the proceedings. Despite that, the movie moves at a good pace and the execution seems solid. We get to see the usual things we want in a Trek project: the crew encounter apparently overwhelming odds and Kirk must scheme his way out of the predicament. It also tosses in a little comedy, some pathos, and a bit of strong action to make the proceedings compelling. Because of the nature of the story, Spock (Leonard Nimoy) remains almost-totally absent from the film, and that becomes another reason Search may suffer in some folks' eyes. Indeed, I did miss the interplay between Kirk (William Shatner), Spock and McCoy (DeForest Kelly), especially since we don't even get much of Kirk and McCoy together. Bones was literally not himself for much of the film, so the piece focuses more tightly on Kirk than most. While that's fine, it does make the movie seem less fully Trek than most; no other flick in the series so strongly highlights one character. I actually thought Shatner seems unusually good in this effort. Yeah, he's still a ham, and his acting always earned the mockery it received, but he fits Kirk to a "tee", and he holds up to the added focus here well. I especially liked the way he communicated his relationship with his son David (Merritt Butrick). We only learned of David's existence in the prior film, so there's been virtually no time for the two to develop a connection in front of us. Nonetheless, Shatner aptly conveys the burgeoning bond between the two, and he does this almost single-handedly. Guest actor Christopher Lloyd also appears solid as Klingon commander Kruge. Klingons tend to all seem a lot alike, but Lloyd brings a fine spark to the role. There's something about him that adds an element of personality to the role that wasn't there in the script and that lacks in most other Trek aliens. One oddity about the Klingons in this film: although they usually speak Klingon amongst each other, sometimes they lapse into English. This occurs for no apparent reason. All I can figure is someone at Paramount thought, "Say - we're gonna need a lot of subtitles for all this Klingon dialogue. People hate subtitles - better inject some English!" It doesn't hurt the movie, but I found it to make for an odd inconsistency. Despite that, I continue to really like Star Trek III. It's a firmly middle-of-the-pack offering for the crew of the Enterprise, but since most of their films are pretty good, that's not a bad thing. It can be basic at times, and it lacks some of the customary Trek pizzazz, but it remains a lot of fun. 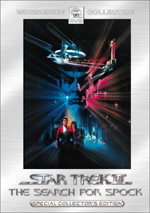 Star Trek III: The Search For Spock appears in an aspect ratio of approximately 2.35:1 on this single-sided, double-layered DVD; the image has been enhanced for 16X9 televisions. Although the picture showed its age at times, it generally provided a solid presentation. Sharpness seemed very good. The movie consistently displayed a crisp and distinct image. Softness never caused any concerns, as the film remained distinct and accurate. Jagged edges and moiré effects also presented no issues, but I did notice a smidgen of edge enhancement on a few occasions. Print flaws created most of the picture’s problems, as I noticed light to moderate grain during a number of scenes. Various examples of speckles, grit and marks also appeared at times. The prevalence of these varied and never became heavy, but they did cause some small distractions. Colors also appeared a bit erratic. For the most part, the hues of Spock looked nicely natural and distinct, but scenes with colored lighting created concerns. Those tended to look a little murky and runny; shots on the Klingon bridge displayed most of the issues. Nonetheless, the hues generally worked fairly well. Black levels came across acceptably deep and rich, while shadow detail looked appropriately opaque but not overly thick. Much of Spock presented very good visuals, but the mix of small concerns knocked down my grade to a “B”. Though it also displayed a few problems, I felt that the Dolby Digital 5.1 soundtrack of The Search for Spock provided a surprisingly strong experience. The soundfield offered a nicely active affair. Given the age of the material, it used all five channels well. Ships flew from speaker to speaker smoothly and cleanly, and the different environmental conditions on the Genesis planet appeared natural and lifelike. The score presented good stereo imaging, and the entire package melded together neatly. The surrounds really added a nice kick to the piece, especially during action sequences or those on the planet. The decloaking of the Bird of Prey offered a wonderfully involving and dynamic segment. Audio quality varied but usually seemed quite positive. Speech showed the weakest elements. Although most of the lines came across as distinct and they always remained intelligible, the dialogue occasionally appeared somewhat flat and dull. Still, those pieces lacked edginess and they were acceptably natural. Music could have boasted a moderately bolder presence, but the score still sounded reasonably bright and vibrant; those elements didn’t impress me tremendously, but they seemed more than acceptable for the age of the material. Though the effects also were erratic, they possessed some very impressive aspects. On the negative side, a few stems sounded somewhat thin, and I noticed mild distortion in a few shots such as the explosion of a ship. However, much of the time these elements provided a much stronger impact than I expected. Scenes that involved the Klingon Bird of Prey presented a wonderfully deep bass rumble, and other low-end sequences packed a nice punch. Bass response remained rich and tight and never became boomy or inappropriately heavy. Overall, the audio seemed very strong, and it worked much better than I’d expect for an 18-year-old movie. If you’re considering The Search for Spock to obtain video and/or audio upgrades over the original DVD, you’ll not find distinguishable improvements here. To these eyes and ears at least, both picture and sound seemed identical when I compared the two DVDs. However, I didn’t regard this as a major concern. Obviously I really enjoyed the audio, so I can’t complain that it remains the same. As for the image, I would have liked to see some cleaning occur, but the picture seems generally positive. So far I’ve not detailed anything about this new DVD of Star Trek III that differed from the original “movie-only” disc. However, now that I can discuss the package’s supplements, that situation will rapidly change. Most of the extras appear on DVD Two, but the first disc includes a couple of significant pieces. 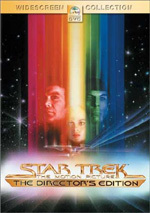 First we find a running, screen-specific audio commentary from director/actor Leonard Nimoy, writer/producer Harve Bennett, director of photography Charles Correll, and actor Robin Curtis. Each participant was recorded separately for this edited track. As its only flaw, the commentary suffered from more than a few short empty spaces. These popped up too frequently, but they never lasted terribly long, so they didn’t interfere badly. The excellent content of the track helped compensate for them. Not surprisingly, Nimoy dominated the proceedings. He covered a lot of useful topics. From how he landed a spot in the director’s chair to the debunking of myths to working with the cast and crew to his development of Vulcan legends, Nimoy proved to be chatty and engaging; he really provided a great deal of compelling notes. The rest of the participants popped up less frequently, but they also contributed some good material. Bennett detailed some storytelling notes as well as the challenges of working within the Trek universe. He also mentioned the theatrical trailer I slam later in this review; it was interesting to learn how that crummy ad came to be. Correll tended to stick with technical topics and noted lighting issues among other things, whereas Curtis logically related her own perspective as a Trek newcomer. She discussed her auditions and her reactions to the world of Trek and also let us know about Nimoy’s directorial style. Despite the gaps, this commentary seemed lively and entertaining, and it probably offered the most entertaining Trek track to date. In addition to this piece, the DVD provides a text commentary written by Michael Okuda, the co-author of the Star Trek Encyclopedia. If you’ve checked out Okuda’s text tracks for the first two Trek special editions, you’ll know what to expect here. He provides a wealth of interesting notes. Okuda details lots of connections between Spock and other pieces of Trek as well as notes about cannibalized parts of the set, character continuity, and many other elements. It’s a very interesting commentary that added to my knowledge of the Trek universe. After this, we move to DVD Two, where the remainder of the supplements reside. 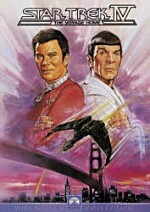 The Captain’s Log offers a 26-minute and 10-second compilation of recent interviews with director/actor Leonard Nimoy, producer/writer Harve Bennett, associate producer Ralph Winter, director of photography Charles Correll, and actors William Shatner, Christopher Lloyd and Robin Curtis. 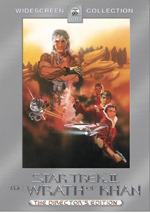 As with a similar program on the Wrath of Khan special edition, this one doesn’t really try to be a total overview of the film’s creation, it covers the most significant topics. We learn how Nimoy rose to occupy the director’s chair and various concerns related to that decision. Some solid production anecdotes are tossed into the mix as well during this engaging and informative program. The next batch of extras show up in a section called The Star Trek Universe. Space Docks and Birds of Prey lasts 27 minutes and 48 seconds as it discusses some of Spock’s special effects. It mainly concentrates on models and the way the crew dealt with them. We learn about the design of the space dock, the ships, and some of the props, and we also get information about how they shoot these elements. The program offers interviews with associate producer Ralph Winter, additional spacecraft designer Bill George, supervising modelmaker Steve Gawley, director Leonard Nimoy, and visual effects cameraman Scott Farrar. Though the piece seems a little dry at times, it offers some interesting information, especially in the design domain; I particularly enjoyed the discussion of how they came up with the Klingon Bird of Prey. For information about Speaking Klingon, we go to this interesting 21-minute and three-second program. It concentrates solely on a chat with linguist Marc Okrand, the man who largely invented the Klingon language. In this program, he discusses how he got involved with Trek and goes over the sources that influenced his decisions. Okrand also talked about working with the actors on the set and other issues. Overall, this offered a cool look at the topic; it seemed much more compelling than I expected, given the geekiness of the subject. For the final component of “The Star Trek Universe”, we look at Klingon and Vulcan Costumes. The 12-minute and 16-second program provides information from jewelry designer Maggie Schpak and costume designer Robert Fletcher. The latter mainly chats about the way he influenced the biology of the Klingons, while Schpak dominates the piece. She discusses the creation of many clothing props and then leads us through a look at many of them. The show seems generally interesting, mainly as it provides a nice glimpse of the influences behind the clothing designs. That ends the pieces found in “The Star Trek Universe”. Next we find a program called Terraforming and the Prime Directive. This 25-minute and 50-second show examines the realities around some topics alluded to in Spock. We hear from author David Brin, NASA research scientist Chris McKay, and Planetary Society executive director Dr. Louis Friedman. They cover subjects that relate to planetary exploration, the creation of life on other planets – with a particular emphasis on Mars – and the implications of these concepts. An intelligent and thought-provoking piece, “Terraforming” offers an intriguing examination of some scientific subjects. In addition to the film’s overly-revealing theatrical trailer, the DVD includes two pieces in the archives. Storyboards covers art for 10 different scenes. Each of those includes between 10 and 64 frames for a total of 283 storyboards. These seem reasonably interesting for what they are. Most amusing are some of the temporary scribblings, such as the name Star Trek III: Exciting Title Here. The other part of the “Archives” includes Photos. Within that domain, “Production” provides 25 shots from the set, while “The Movie” offers 26 images from the set and some publicity snaps as well. Lastly, we get a teaser trailer for Star Trek: Nemesis, the series’ 10th cinematic outing. As usual with Paramount’s releases, most of the extras provide both English and French subtitles. While not the best film of the series, Star Trek III: The Search For Spock offers a generally entertaining and exciting piece of work. It lacks some of the chemistry we normally expect from Trek, it compensates with lively action and other compelling elements. The DVD provides good picture with surprisingly excellent audio and a very nice set of supplements. That latter domain marks the only change I noticed between this “Special Edition” release of Spock and the original “bare-bones” package. To me, the two DVDs provide virtually identical image and sound quality. That means that for folks who already own the basic Spock, the question of a repurchase depends on how much they like extras. If you don’t own the original release, then this is the one to get. If you do possess the old set and don’t care about supplements, then stick with it. Otherwise, the special edition seems like the best version of Spock on the market, and I definitely recommend it to Trek fans.